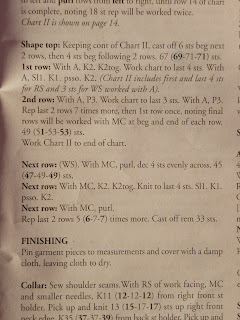 I'm stuck with the 1st row and 2nd row instructions- the thing that's frustrating me about patterns in general is the "word problem" quality they seem to have... saying things like "do "x" 4 times, every 3rd odd row"... or whatever... it is soooooo confusing - and since I'm working a chart, and the chart is patterned (see below) I don't really understand where I am supposed to do what... now I do notice in the photo on the cover of the book that this pattern comes from, that there appears to be a few stitches of solid white where the sleeve and front attach, but I don't see that in the chart and while I know it's hinted at in the instructions, I don't know what I'm doing... so I'm asking for your help! Thanks for your help! - Happy December 12th! OK, first, breathe. 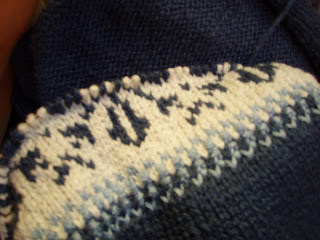 A pattern is just a guideline, and nothing bad is going to happen if a stitch or two is lost in translation. That said, I think you have interpreted it correcltly and I'd do as you said, decreasing at either end and continuing the chart pattern in the middle. See, you know exactly what you're doing! 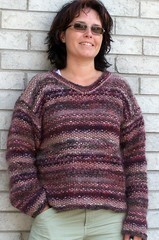 Beautiful sweater, by the way. I think that you're interpreting it right and that once you do it and see the pattern you'll be, like, "D'oh!!". The K2, k2tog are the 3 "dot" stitches, then you'll have 2 grey sts etc, to the end, your last 3 sts being 2 dot sts (s1 k1 psso - which I would do as a ssk, but that's just me - and k1) and a grey one (k1). I hope that I haven't made it even more confusing!! Deep breaths & be one with the sweater. It looks great and you seem to be doing all the right things. Sometimes, with charts, you just have to read and trust. I agree about the breathing too, otherwise you will stress out and become totally confused. Besides, it is just yarn and if you make a boo-boo, you can fix it. No problems. Keep up the good work. 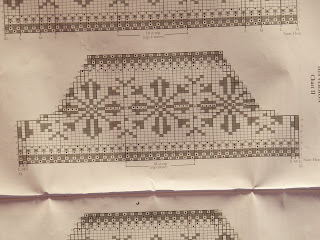 Ok, I cannot speak against the Goddesses of Knitting, but look at the wordings, it says, "Chart II includes first and last 4 stitches for RS and 3 sts for WS worked with A." Doesn't that mean that you would work the decreases within the chart??? That's my instinct. Good luck. I am of no use in a tutorial situation. Fair isle scares me. Kudos for taking the risk. I'm off to my "stockinette in the round" project. I hope you still like me anyway. I just want to say have a great Merry Christmas!